Oil Outlook 2019: Long-Lost Recovery or Price Crash? Special Report: Oil Outlook 2019: Long-Lost Recovery or Price Crash? Are the days of $150 oil over? You remember those days, right? If you've ever had any skin in the game, it was quite a nerve-wracking experience — especially if you were playing the wrong side. More importantly, it was far easier to call the bottom back then and profit from it. In fact, a sudden price spike is the last thing that we want to see happening. Remember, if crude prices rise too high and too soon, it will only cause a flood of oil coming out of the U.S.' various tight oil plays. The moment those E&P players in the lower 48 learn that they can bolster their cash flows from higher prices, they’ll immediately turn on the taps. Above, you’ll find a list of how many drilled but uncompleted wells (DUC) can be found in our largest oil-producing regions. 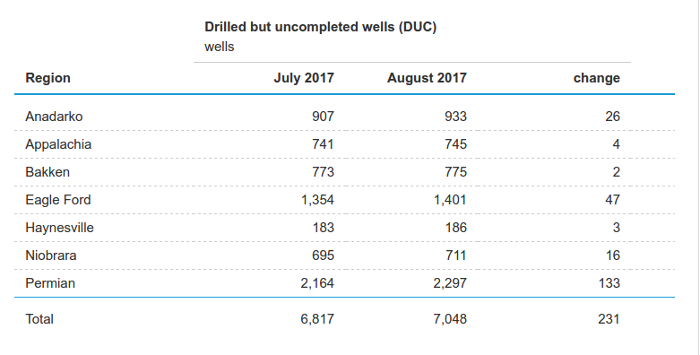 In August, there were more than 7,000 DUC wells in total. The cash-strapped upstream sector in the oil industry would love nothing more than to complete those wells and sell that crude for a handsome profit on the back of a price spike. Unfortunately for them, it’s taking more and more to spook the market these days. It seems as if there’s always a daily headline somewhere that's reporting a new missile launch in North Korea or another outbreak of fighting in the Middle East. I remember a time when the mere thought of a supply disruption would send traders into a frenzy. Is it possible that the Middle East turmoil has become white noise? Maybe. So, what should we expect for next year? Oil Outlook 2019: Long-Lost Recovery or a Price Crash? I told my readers recently that the road to recovery would be slow going. In 2016, the cost for a barrel of Western Texas Immediate (WTI) averaged $43.33. 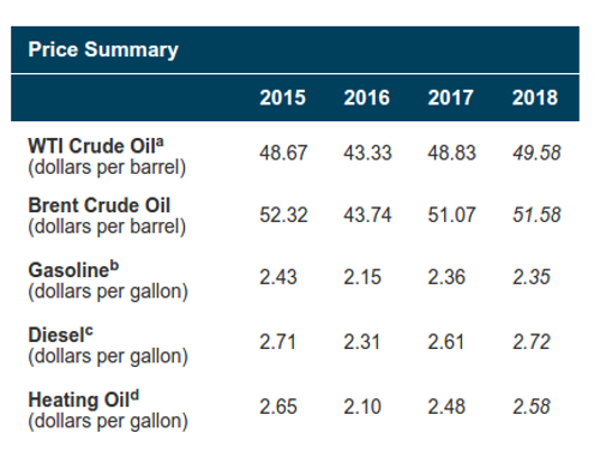 This year, WTI is expected to average $48.83 per barrel. Next year, oil will continue trending higher as the supply and demand imbalance works itself out. The EIA is currently forecasting that WTI prices will be increasing roughly 1.5%, averaging approximately $49.58 per barrel. Yet, despite the slight price increase expected year over year, the EIA’s Short-Term Energy Outlook is projecting that gasoline prices will remain flat in 2018, averaging just $2.35 per gallon. Look, you and I both know that there is a myriad of factors that swing crude prices one way or the other. Today, it seems like a new natural disaster is springing up daily. And I don’t just mean bad weather. These events have been utterly catastrophic, from back-to-back to back-to-back hurricanes (from Harvey to Irma to Jose to Maria) to the devastating earthquake in Mexico that has killed over 250 people. These terrible events have had an incredible impact on the supply and demand dynamics. Remember: Hurricane Harvey knocked out more than a dozen refineries along the U.S. Gulf Coast, including both the largest and second-largest oil refineries in the U.S. — Saudi Aramco’s newly acquired Port Arthur Refinery and Exxon’s Baytown facilities in Texas, respectively. If you only take one thing away from this today, let it be this: Focus on the fundamentals. Ultimately, balancing out the supply and demand imbalance is the largest catalyst for this fragile recovery. The EIA reported that U.S. oil output in 2018 averaged 10.96 million barrels per day (bpd). Next year, the EPA is expecting our domestic crude production to jump about 12%, averaging 12.1 million bpd. Now, I know that betting on oil isn’t as popular as it was a decade ago. The excitement over the shale boom has tempered, somewhat, after prices crashed between the summer of 2014 and February of 2016. Hey, even I'm getting caught up in the electric vehicle (EV) revolution that is just starting to build momentum. It’s almost impossible not to, given that Tesla has officially rolled out its Model 3. Just remember to keep your expectations tethered to reality. Between 2015 and 2040, the EIA is estimating that global energy demand will rise 28% — from 575 quadrillion British thermal unit (Btu) to 736 quadrillion Btu! In today’s low oil price environment, it’s far more difficult to find the right winner. Unfortunately, this means that a lot of the investment herd will lose their shirts from betting on the wrong horses. We’re in a stock picker’s market today, and the field of winners is a lot slimmer than it was in 2009. For those of you who are seeing the buying opportunity right now, I'm recommending that you focus your due diligence right here at home — where the best oil stocks on the planet are drilling right now!